Hello hello festive friends! It’s that very exciting time of year when I share the loveliest outward-bound gifts in the land with you, just in time for Christmas. 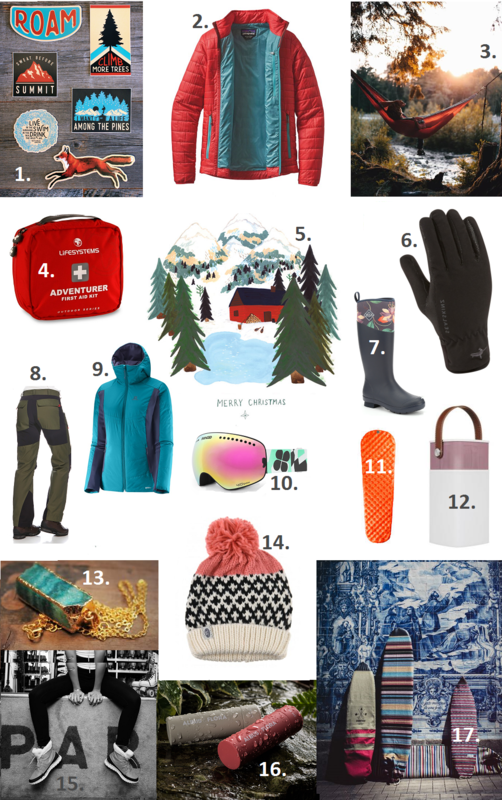 Find the perfect present for surfers, sailors, cyclists, explorers, wild camper wannabes and wood cabin owners. And have a merry, merry Christmas! Revive your inner 5 year old’s sticker obsession with these awesome vinyl designs. Show off Village and Wild’s inspirational mantras and gorgeous leaping fox by sticking them to lunchboxes, campervans, pets… Must remember: climb more trees. Every climber worth their chalk is togged up in a cosy down jacket come winter, but down can be a problematic material, sometimes sourced from force-fed or live-plucked birds. Say no to animal cruelty and buy a climber a Patagonia puff – their jackets are always stuffed with traceable, ethically-sourced down and are amazingly light, windproof and water-resistant. Fancy a night sleeping among the trees? Once you try hammock camping, you’ll be spoiled for tents forever. It’s so much more fun to swing yourself to sleep between a pair of pines, and it’s easier on your back, too – no more waking up all stiff. Simply Hammocks stock a huge range, and their no-fuss travel kit is easy to pack for global adventures. Safety first, kids! This small bag is a bit of a Mary Poppins number, containing a huge amount of useful bits and pieces for dealing with basic injuries. A must-pack for mountaineers. The lovely Keiko Brodeur (read my interview with her here) designs the most charming of adventure prints, including covetable cabins, travel snapshots and illustrated packing lists. Her little log cabin makes a wonderful Christmas card or framed print. Pop your hands in Sealskinz’ fully waterproof gloves and all others will pale besides them. Loved by adventurers, these are worth the investment to keep your mitts warm and dry for years. Cheerful wellies for the most miserable of days, inspired by Britain’s country gardens. Muck Boot wellingtons are fleece-lined to keep you warm in bitter weather – ideal for working in the yard or the garden, or for taking the dog out for a run on frosty mornings. Hiking trousers which can withstand cold and wind and still look flattering from behind. Seriously. These super comfortable cotton trews are rugged enough for tough outdoor work and all-day hikes. The ultimate mid layer is here. One side of the reversible Drifter is made of tough, windproof and water resistant fabric, ideal as an outer shell on warmer days. The other side is stretchier woven fabric – wear as a midlayer in heavy rain or for snow sports. The perfect versatile gift for outdoorsy all-rounders. The makers of the coolest sport sunglasses have turned their skills to rad ski goggles. The Revolts are fully customisable, a process so addictive you may find hours have passed whilst you’ve been picking exactly which strap you want to pair with the perfect lenses for bluebird days. A great sleeping mat will totally revolutionise how you sleep when camping, especially if you’re out in the wilderness for weeks. Sea to Summit stock a brilliant range, but this ultralight mat (480g) is easy to carry for wild camping trips and long-term travel. It may look like a small picnic basket but this little box of delights is actually a powerful Bluetooth speaker. Light and portable, it’s the perfect way to fire up the tunes at summer camp-outs and weekends in the country. It also doubles up as a soft light, ideal for camping. Buddy Bear’s pretty quartz necklaces let you carry a little piece of the natural world around your neck. They also do mini mountain ranges, leaves and dinky foxes to help remind you of the call of the great outdoors if you’re stuck in the city. Just the fluffiest, bobbliest beanie hat about. A lovely stocking filler or secret santa present for an outwards-bound lady. A pair of Sorel boots should be in every seasonnaire’s wardrobe, and these sheepskin-lined beauties will take you everywhere from shovelling snow to apres ski. I like the fire-engine red ones, which look like Father Christmas might wear them on his skiing holidays. The clever clogs at Albus and Flora make deeply nourishing, vitamin-rich tinted lip balms with names so delicious it’s hard not to want to eat them (Red snowberry, anyone?). They all offer SPF 30 protection to protect your lips from the elements in the sea and the snow. What do you buy for the surfer who has everything? I’d suggest one of these rather slick surfboard bags, handmade by cool Portuguese label Mar Dentro, to keep their stick all cosy. Or you could even make your own out of hessian if you’re handy with a sewing machine. Previous Post Climbing packing guide: what’s in my climbing rucksack?